We will be interviewing new teachers. We will be practicing different kinds of arguments. We will be trading teams and analyzing results. Len Yacullo and I will work with you on key vocabulary. We will have some time for writing plays. We will talk about two upcoming projects and begin doodlestones. The Good Deed Club watched a video about a six-year-old orphan in Savannah, Jaden Hayes, who decided that he was tired of everyone looking so sad. The young boy set out to cheer up strangers by giving them rubber duckies and other small toys. This project, which began in August, has picked up momentum. 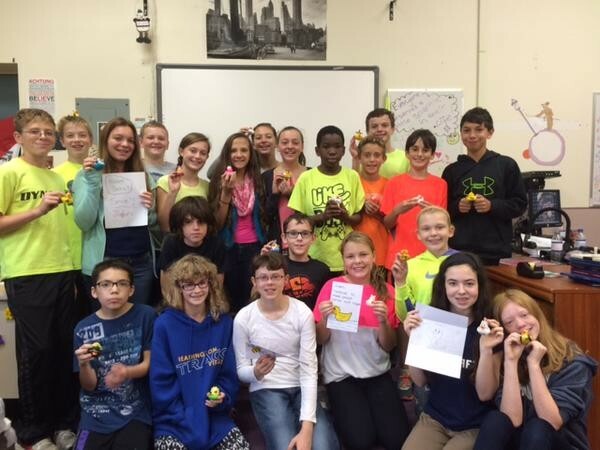 We were inspired and wrote letters of encouragement to Jaden, decorated rubber duckies, and are preparing to send them off later this week. The seventh and eighth graders met with Len Yacullo of the Y program on Wednesday. They received registration forms and packets. Once registration forms are received (ASAP), we will get our countries! In the meanwhile, we will meet on Wednesdays for the full period to learn key terms associated with the Model UN and this year's topics. Note: The organization sponsoring the Hershey Conference has said that money should not stand in the way of participation. If there are financial issues, let Mr. Yacullo know (his email is in the packet) and they will see what can be worked out. Each student drafted three countries, and received password and login information for the Fantasy Geopolitics Website. Students can make trades or switch countries at any point, but they will also have a chance to do so at session on Wednesday. The website contains a great deal of information to help with choices. 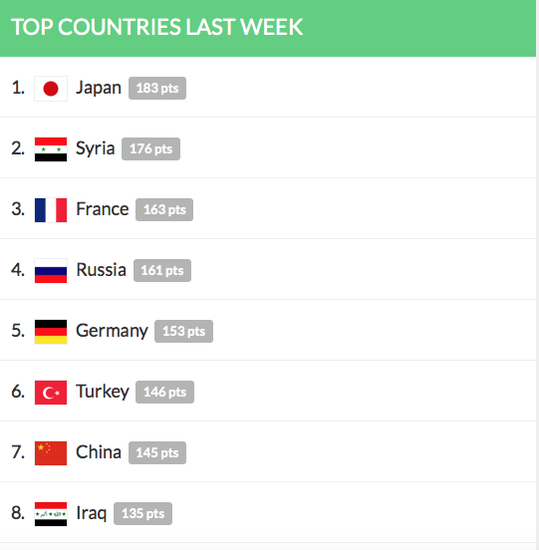 Below, I have posted the top countries from the week of 10/3. They are rated the highest because of frequent recurrence in the NY Times and other news sources. Students are working on creating plays with the Who? What? Wall! technique. The sixth graders read aloud Becca Bowser's clever play about a princess who was possessed by an evil frog. We have amazing performers in this group! The seventh and eighth graders are at different stages in their writing. I love how they all support one another so eagerly! Young Playwrights is officially an academic support time group, but students who bring lunch can stay through lunch period if they so choose. All students interested in taking part in this event should RSVP by October 30th. IMPROMPTU SPEECH: You will be given a topic and five minutes in which to prepare and present a creative and animated speech on that topic. This is an INDIVIDUAL event. EXTEMPORANEOUS DEBATE: You will be given a resolution and a side (pro or con), and you will have thirty minutes to prepare. Then, you will take part in a moderated debate on that topic. You may choose to compete as an INDIVIDUAL or as a teacher-assigned TEAM. MIDDLE SCHOOL DEBATE: You will be given a resolution a week before the competition. You will have a week to prepare, but you will not know your side until you attend. On October 30th, you will take part in a moderated debate on the assigned topic. You will compete in a team of two to four students of your choosing. You must let me know your TEAM in advance.